The cost of some major road projects carried out within the past three years had risen above their original estimates during the construction phase, the Auditor General’s 2014 Annual Report reveals. It also highlights other irregularities and the colossal waste of millions of rupees as a consequence of poor planning and implementation. “Substantial increases in the estimated cost, as well as instances where the functions of the foreign projects could not be completed during the expected period, were observed in audit due to subsequent changes of the scope of work of the foreign funded projects,” says the report which was recently presented to Parliament. Among the significant observations is that the Athurugiriya interchange of the Rs. 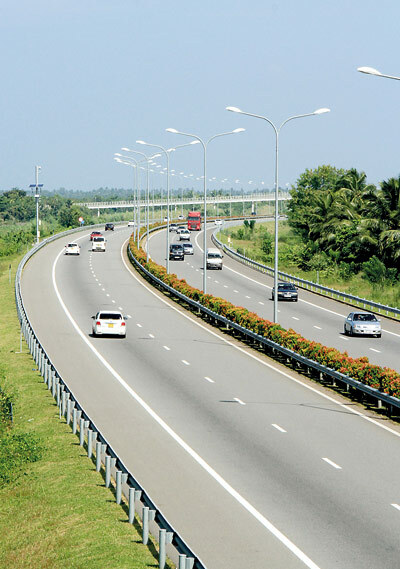 72.92 billion Colombo Outer Circular Expressway was not included in the project’s original plans. However, the interchange centre was completed at a cost of Rs. 475 million as a variation of the original estimate. “The cost of the road from Matara to Godagama rehabilitated under the National Roads Sector (Additional Financing) Project had increased by Rs. 14 million due to variations extraneous to the original plan,” the report states. The construction of a building for the Highways Secretariat was started in August 2010 under the National Roads Sector Project. The plan was for eight stories but two more floors were added subsequently. The original estimate of Rs. 1 billion had increased up to Rs. 1.96 billion by December last year. Construction had not been fully completed even by December 31, 2014. A large number of projects were implemented without preparing an overall plan or annual action plan, the Auditor General observes. For instance, a temporary interchange was built at a cost of Rs. 259 million at the Kottawa interchange of the Colombo Outer Circular Expressway in time for the Southern Expressway opening. The temporary interchange was then removed at the cost of Rs. 8.27 million and the permanent interchange constructed at a cost of Rs. 945 million. Similarly, a temporary interchange was constructed at Rs. 176 million at Kotelawala in Kaduwela. It was removed in March this year at the cost of Rs. 10 million. These expenditures were brought to account as “expenditure of Colombo Outer Circular Highway Project-Part I”. Under the Road Development Authority (RDA) subhead, the report says Cabinet had approved loans to the tune of Rs. 151 billion from local banks for the rehabilitation of 64 roads (1,434km) under the purview of the RDA. Contracts to the value of Rs. 137.5 billion were awarded for the rehabilitation of these 64 roads. The total loans obtained in cash from seven local banks from 2012-2013 for rehabilitation of those roads came to Rs. 108 billion. Out of those contracts awarded, the contract value of Rs. 146.5 billion (relating to 54 roads recommended by a Technical Evaluation Committee) had been increased by Rs. 9.24 billion by the Procurement Committee appointed by the Cabinet of Ministers. There is no explanation in the report for why this happened. The RDA had also obtained a further Rs. 28 billion for the rehabilitation of 28 roads out of 64 road contracts awarded. This money was spent by the Authority and the Ministry of Highways on “activities extraneous to the rehabilitation of roads”. Cabinet approval and Treasury had not been obtained. A provision of Rs. 15.23 billion was made to widen and improve 141 roads during 2014. However, this was not utilised. But Rs. 2.7 billion was spent on 33 roads not included in the annual action plan, despite non-availability of provision. A further Rs. 38.5 billion was spent on widening and improving 900 roads that did not fall under the purview of the RDA. The progress of widening and improving 61 RDA roads and 234 non-RDA roads had been below 50 percent as at December last year. Even though a provision of Rs. 493.83 million had been made by the annual budget for the maintenance work of 186 roads included in the maintenance programme of 2014, such maintenance work had not been carried out. Nevertheless, a sum of Rs. 1.248 billion had been spent on maintenance of 281 non-RDA roads despite the non-availability of budgeted provision. The report also highlights irregularities in connection with Maga Neguma Road Construction and Equipment Company which was formed under the previous administration. It was found that the RDA had advanced Rs. 6.1 billion to the Maga Neguma Company during the year under review, even though such payments should have been made after submission of bills and assessment of work done. Money was advanced in this manner 55 times. RDA had given the Maga Neguma Company Rs. 63.27 million worth of assets, materials and spare parts between 2004 and 2007. But no effort was made to get them back. RDA had also failed to recover Rs. 488.86 worth of motor vehicles rent from Maga Neguma between 2008 and 2013. Twenty motor vehicles in unserviceable condition had not been returned by Maga Neguma to the RDA. Under the “Ministry of Highways and Investment Promotion – Projects (on Foreign Loans and Domestic Funds)” subhead, the report notes that money allocated by a lending agency for two outer circular road projects had not been utilised within the due period. his has led to a “commitment charge” of Rs. 803.94 million being recovered by the lending agency. The Ministry had spent Rs. 161.33 million on activities “extraneous to the objectives” of three projects initiated for building of roads on foreign and domestic loans. Constructions valued at Rs. 46.925 billion for two projects had been awarded deviating from tender procedure. Eleven consultants for primary education activities had been recruited by spending Rs. 119.26 million, deviating from tender procedure.